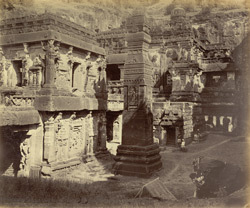 Photograph of the Kailasa Temple at Ellora from the 'Lee-Warner Collection: 'Bombay Presidency. William Lee Warner C.S.' taken by J. Johnston in the 1870s. The site of Ellora is famous for its spectacular series of Hindu, Buddhist and Jain cave temples excavated into the rocky façade of a basalt cliff. The works were carried out under the patronage of the Kalachuri, the Chalukya and the Rashtrakuta dynasties between the sixth and the ninth centuries. The Kailasa Temple is a free-standing temple entirely sculpted out of the rock. This royal monument was patronized by rulers of the Rashtrakuta dynasty from the mid-eighth century. The temple symbolizes Mount Kailasa, the abode of Shiva. The monolithic obelisk in this view is situated on the side of the main temple. It is 16 metres high and decorated with relief carvings. The carvings that decorate the Kailasa temple depict tales from the Ramayana, the Mahabharata, and the life of Shiva.